This sandwich is packed with a medley of satisfying flavors. 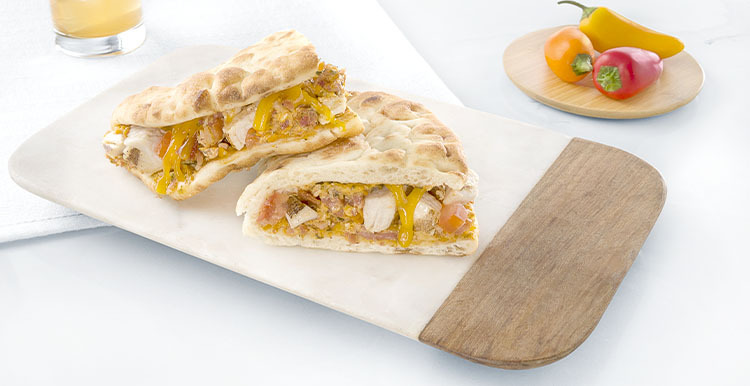 Juicy cuts of chicken, roasted tomatoes, savory bits of bacon, cheddar cheese, and a creamy herb ranch spread are deliciously combined and folded in a satisfying flatbread. Ingredients: FLATBREAD (ENRICHED WHEAT FLOUR [WHEAT FLOUR, MALTED BARLEY FLOUR, NIACIN, REDUCED IRON, THIAMIN MONONITRATE, RIBOFLAVIN, FOLIC ACID], WATER, BREAD BASE [WHEAT GLUTEN, TAPIOCA STARCH, OAT FIBER, WHEAT PROTEIN ISOLATE, SUNFLOWER OIL, WHOLE WHEAT FLOUR, SEA SALT, SESAME FLOUR, CALCIUM SULFATE, MONOGLYCERIDES, ENZYMES], LESS THAN 2% SUGAR, YEAST, NATURAL MOLD INHIBITOR [CULTURED WHEAT FLOUR, VINEGAR], WHEAT GLUTEN, SUNFLOWER OIL, OLIVE OIL, SEA SALT, SODIUM BICARBONATE, SODIUM STEAROYL LACTYLATE, SODIUM ACID PYROPHOSPHATE, ENZYMES), GRILLED WHITE MEAT CHICKEN, TOMATOES (TOMATO, CALCIUM CHLORIDE), HERB RANCH SPREAD (CREAM CHEESE PRODUCT [MILK AND CREAM, NONFAT MILK, CHEESE CULTURE, SALT, STABILIZERS [CAROB BEAN AND/OR XANTHAN AND/OR GUAR GUMS]), GARLIC, BUTTERMILK POWDER, RANCH SEASONING [BUTTERMILK POWDER, SALT, MALTODEXTRIN, ONION, GARLIC, SPICES, XANTHAN GUM, TORULA YEAST AND LESS THAN 2% ONION, CHIVES, LEMON JUICE CONCENTRATE, SPICES), COOKED BACON TOPPING (BACON [CURED WITH WATER, SALT, SUGAR, SODIUM ERYTHORBATE, SODIUM NITRITE. MAY ALSO CONTAIN DEXTROSE, FLAVOR, HONEY, DRIED PORK BROTH, POTASSIUM CHLORIDE, POTASSIUM LACTATE, SMOKE FLAVOR, SODIUM DIACETATE, SODIUM PHOSPHATE]), CHEDDAR CHEESE (MILK, CHEESE CULTURES, SALT, ENZYMES, ANNATTO COLOR, POTATO STARCH, CORN STARCH, POWDERED CELLULOSE [ADDED TO PREVENT CAKING]). Nutrients: FLATBREAD (ENRICHED WHEAT FLOUR [WHEAT FLOUR, MALTED BARLEY FLOUR, NIACIN, REDUCED IRON, THIAMIN MONONITRATE, RIBOFLAVIN, FOLIC ACID], WATER, BREAD BASE [WHEAT GLUTEN, TAPIOCA STARCH, OAT FIBER, WHEAT PROTEIN ISOLATE, SUNFLOWER OIL, WHOLE WHEAT FLOUR, SEA SALT, SESAME FLOUR, CALCIUM SULFATE, MONOGLYCERIDES, ENZYMES], LESS THAN 2% SUGAR, YEAST, NATURAL MOLD INHIBITOR [CULTURED WHEAT FLOUR, VINEGAR], WHEAT GLUTEN, SUNFLOWER OIL, OLIVE OIL, SEA SALT, SODIUM BICARBONATE, SODIUM STEAROYL LACTYLATE, SODIUM ACID PYROPHOSPHATE, ENZYMES), GRILLED WHITE MEAT CHICKEN, TOMATOES (TOMATO, CALCIUM CHLORIDE), HERB RANCH SPREAD (CREAM CHEESE PRODUCT [MILK AND CREAM, NONFAT MILK, CHEESE CULTURE, SALT, STABILIZERS [CAROB BEAN AND/OR XANTHAN AND/OR GUAR GUMS]), GARLIC, BUTTERMILK POWDER, RANCH SEASONING [BUTTERMILK POWDER, SALT, MALTODEXTRIN, ONION, GARLIC, SPICES, XANTHAN GUM, TORULA YEAST AND LESS THAN 2% ONION, CHIVES, LEMON JUICE CONCENTRATE, SPICES), COOKED BACON TOPPING (BACON [CURED WITH WATER, SALT, SUGAR, SODIUM ERYTHORBATE, SODIUM NITRITE. MAY ALSO CONTAIN DEXTROSE, FLAVOR, HONEY, DRIED PORK BROTH, POTASSIUM CHLORIDE, POTASSIUM LACTATE, SMOKE FLAVOR, SODIUM DIACETATE, SODIUM PHOSPHATE]), CHEDDAR CHEESE (MILK, CHEESE CULTURES, SALT, ENZYMES, ANNATTO COLOR, POTATO STARCH, CORN STARCH, POWDERED CELLULOSE [ADDED TO PREVENT CAKING]).